Who doesn't love chocolate? I mean, especially really good quality chocolate that is beautifully packaged for Valentine's Day? I know I do! Since chances are good that you agree, I'm excited to announce that I'm hosting an Ethel M Chocolates Giveaway for MommyBlogExpert readers. In addition, I am pleased to share a great savings deal with you from this delicious brand. 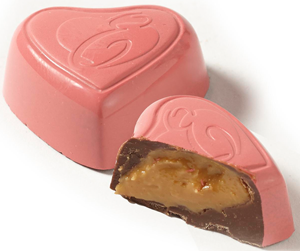 You'll get Free Shipping on any $55+ Ethel M Chocolates candy order when using the special code CUPID14 at checkout. Read on to enter for your chance to win a gorgeous box of Ethel M Chocolates filled with candies in an assortment of six flavors, each enrobed in a different festive seasonal color chocolate valued at $65. This Ethel M Chocolates MommyBlogExpert (MBE) Giveaway ends February 14, 2014 at 12 am PT. Contest open to legal residents of the U.S. only. Winner of this MBE contest will be selected at random from all entries and will be notified via email and must respond within 24 hours to claim their prize. 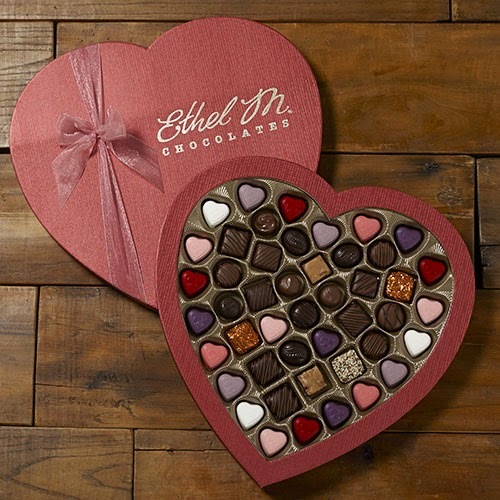 Ethel M Chocolates will award one Grand Prize Winner a Valentine's Day Heart Chocolate box valued at $65. FTC Disclosure: This is a sponsored post for SheSpeaks/Ethel M Chocolates and I am receiving compensation in exchange for my time hosting this giveaway as well as for writing a separate upcoming product review blogpost. However, all opinions here are my own. In addition, Ethel M is providing the prize and shipping for the giveaway. See complete FTC Disclosure information that appears at the bottom of MommyBlogExpert's main page and at the bottom of every individual post on this blog, including this one. I'd like to win this for my grandma! She'd love it! Love to win this for my wife for V-Day! I could use some brownie points around here! I want to win this because it looks yummy! Very pretty too! Thank you! I would love to receive chocolates for Valentine's Day like I did when my honey and I were dating, but we've been married over 30 years....haven't received them of late. I would like to win because these look delicious and beautiful for Valentines day. Thanks for the chance! I would love to win because my husband is still in training and is very good at forgetting Valentines day... Sadly the birthday too/ thank you for the opportunity! Of course, it might be fun to eat the chocolate, but it might be even more fun to give it to someone. Thanks for the opportunity to win! Love chocolate in all varietys! They look delicious and would love to share with my family. Been to your home base in Las Vegas. Sweet!!! Like to visit again These candies are over the moon!!! I would love to win and surprise my daughter with it. These chocolate look delicious and I've never tried them before. I want to win because it will make a hero with my chocoholic wife. Because I love chocolate! Also, they look so much fancier then normal chocolates. I shouldn't win this because I am a chocoholic and if I win that would make you an enableler, but I fell off the wagon and I can do another 12 steps after Valentine's Day! I want to win this because I'm a huge chocolate fa, and my chocolate stash is getting very low. I would love to win this prize, and share it with my husband and three kids! I Dont have a significant other, so i dont recive valentines Gifts! AND I Love Chocolate!, would be like getting pampered! I want to win because the chocolates look delicious!!! I want to win because I adore fine chocolate. I would share though! I want to win because I LOVE chocolate and can't wait to try it! I want to win this prize because I love chocolate!! i would love to win this for my husband, he is the best. I want to win because I love love chocolate and even my 3 yr old too. I want to win so I can share then with my family because we all love chocolate. Who wouldn't want to win chocolate? Well, other than having to fight over it with your significant other...lol. I want to win because I love chocolate and these look wonderful! I want to win this because who doesn't love chocolate!? I want to win because I love chocolate! I want to win because they look yummy and I really want to try them! I want to win because my kids and I love chocolate! i want to win for my husband.i cant afford to get him anything but he deserves something. I want to win because I could never afford this and it looks so good!! i dont think i am getting any chocs for vday. and i am on my period need i say more? CHOCOLATE!!! I want to win because its chocolate and who doesnt love chocolate? Love chocolate and so does my son. I am addicted to chocolate! Because I LOVE chocolate but would never be able to afford this! Thanks! I want to win this because I have never eaten prettier chocolates. !! Thanks for the chance! I really want to share these with someone deserving like my mother. Because my family LOVES chocolate. And because I want to share chocolate with the people I love! Because nothing comes between me and my chocolate!! I want to win this prize because it looks very tasty!